The Spathiphyllum plant, also known as the Peace Lily, is a popular houseplant that is also a natural indoor air purifier. The plant is native to Columbia and only hardy to grow outdoors in USDA growing zones 10 and 11, which is why it is more common as an indoor houseplant. The Spathiphyllum produces long, paddle-shaped leaves that are dark green with short stems. The flowers grow from long spikes that stand taller than the plant. Flower blossoms on the plant have a large white petal and white bract with a delicate appearance, similar to a calla lily. Spathiphyllum plants grow best when planted in a container that is 1 to 2 inches wider than the root ball with bottom drainage holes. The plant should be planted in a high quality potting soil and placed in a location that receives sunlight from the north, east or west and a temperature of 60 to 85 F. Spathiphyllum can be placed outdoors as long as the temperature is above 60 F.
The Spathiphyllum prefers an evenly moist soil and should be watered every week with room temperature water when the soil begins to feel dry to the touch. The soil should never be allowed to dry out or sit in a tray of water to become oversaturated. City water that is heavily chlorinated should sit for 24 hours prior to applying it to the plant to allow the chlorine to dissipate. Spathiphyllum plant should be fertilized every two weeks during the summer months with a balanced water-soluble fertilizer. Spathiphyllum prefers a humid environment and should be placed near a humidifier during the dry winter months or set on a tray filled with stones and water to increase the humidity levels. Do not set the plant directly in water, because this will promote root rot. 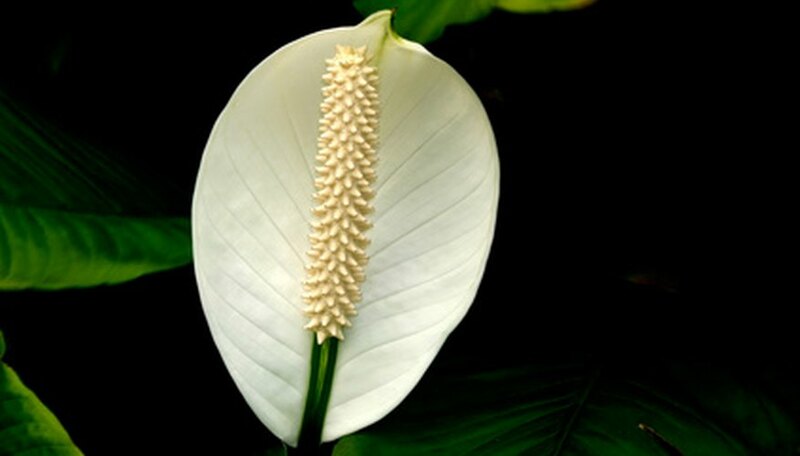 Spathiphyllum plant can be propagated into additional plants by clump divisions. The entire plant should be removed from the container and gently cut apart in sections that include root and foliage. Each division should be planted in a container that is 1 to 2 inches wider than the root ball, filled with high quality potting soil. The Spathiphyllum plant should be monitored for the presence of mites or mealybug insects. The insects are found on the underside of the leaves and feed on the plant. An infested plant should be isolated to prevent the bugs from spreading. Insects can be removed by spraying the leaves with water over a period of several days. Insecticidal soap spray will prevent the insects from returning.